1857 ~ 1871: born in Kamigata. He joins at an early age a troupe of children-actors (Kodomo Shibai) performing in the precincts of shrines and temples (Miyaji Shibai). His master Nakamura Jakuemon I gives him the name of Nakamura Koshiba at an unknown date. 8th lunar month of 1871: his master Nakamura Jakuemon I dies. 1st lunar month of 1872: Nakamura Koshiba takes the name of Bandô Shibazô in Ôsaka at the Tenma no Shibai, playing in the drama "Shôchikubai Tsubomi no Ishizue", which is produced by Arashi Tôkizô. 31st of August 1873: his brother Bandô Jutarô III dies. 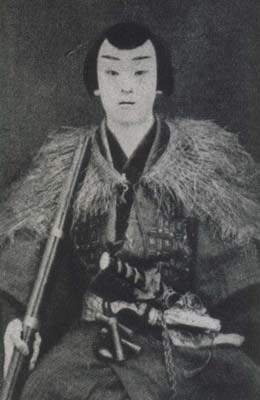 September 1873: Bandô Shibazô takes the name of Bandô Jusaburô II in Ôsaka at the Chikugo no Shibai. February 1877: Jusaburô plays at the Naka no Shibai (Ôsaka) the role of the yakko Mitahei in the drama "Meiboku Sendai Hagi". January 1880: Jusaburô plays at the Ebisuza (Ôsaka) the roles (in alternance with Arashi Ganshô) of En'ya Hangan, Kô no Moronô, Hayano Kanpei, Ichimonjiya Saibê, Ono Sadakurô and Yuranosuke in the classic "Kanadehon Chûshingura". November 1880: Jusaburô plays at the Naka no Shibai (Ôsaka) the roles of Shizuka Gozen and Sagami Gorô in the classic "Yoshitsune Senbon Zakura". His 2 main stage partners are Nakamura Ganjirô I and Arashi Sangorô VI. June 1881: Jusaburô plays at the Naka no Shibai the role of Yosaburô in the drama "Yowa Nasake Ukina no Yokogushi"; the role of Otomi is played by Nakamura Ganjirô I. March 1883: Jusaburô plays at the Naka no Shibai (Ôsaka) the roles of Hayano kampei, Ran-no-Kata and Yazama Jûtarô in the classic "Kanadehon Chûshingura". The role of Okaru is played by Nakamura Ganjirô I.
November 1886: Jusaburô plays at the Kado no Shibai (Ôsaka) the roles of Masaoka, Date Gekizaemon and Katakura Kojûrô in the drama "Meiboku Sendai Hagi"; the roles of Yashio and Hosokawa Katsumoto are played by Nakamura Ganjirô I.
January 1887: Jusaburô plays in Kôbe at the Daikokuza the role of Shizuka Gozen in the classic "Yoshitsune Senbon Zakura". The role of Tadanobu is played by Ichikawa Udanji I.
January 1888: Jusaburô plays at the Kado Gekijô (Ôsaka) the roles of Yakushiji Jirozaemon, Okaru, Tonase and Shioda Matanojô in the classic "Kanadehon Chûshingura". The roles of Yuranosuke, Hayano Kanpei, Teraoka Heiemon and Kakogawa Honzô are played by Ichikawa Udanji I, Nakamura Ganjirô I, Nakamura Jakuemon II and Jitsukawa Enzaburô III. March 1889: Jusaburô appears on stage for the last time, in Kyôto at the Minamigawa no Shibai, playing in the drama "Nezu Gongen Chûshi no Isaoshi". Bandô Jusaburô II was a popular Kamigata actor, able to play almost any kind of roles: jitsuaku, wagoto, wakaonnagata, budôgoto or aragoto. He spent all his short career in Kamigata theaters. Unfortunately he died young at the age of 32. Bandô Jusaburô II playing the role of Hayano Kanpei in the classic "Kanadehon Chûshingura"